On medium high heat, cook potatoes and carrots in a pot with 4 cups of water for 10 minutes. Remove from heat and drain. In a small saucepan, heat the enchilada sauce. In a large frying pan, heat up oil on medium-high heat. Sauté 1/2 chopped onion for 2 minutes. Add cooked potatoes and carrots. Season with salt. Add 1/2 cup of enchilada sauce and let cook for 5 minutes, stirring every once in a while. Remove from heat. Heat up 1/4 cup vegetable oil on medium heat. Carefully fry the corn tortillas one at a time, for 30 seconds on each side. Remove tortillas from oil and let excess oil drain into pan. Dip tortillas in enchilada sauce, one at a time. Make sure to cover them well in the sauce. Remove from sauce and let excess sauce drip from tortillas. Place tortilla on a serving plate. Add cheese, 2-3 spoons of onion, potato and carrot filling over a tortilla. Cover with another tortilla already dipped in sauce and repeat the process until you have 3 or 4 layers. Top with chopped lettuce, jalapeño slices and crema mexicana. Make these enchiladas with flour or whole wheat tortillas for a different flavor. This recipe is for enchiladas mineras, a classic dish from the state of Guanajuato, in Mexico, known for its silver mines. It’s believed that the miners’ wives would make these enchiladas and bring them to the mines for the men to eat. 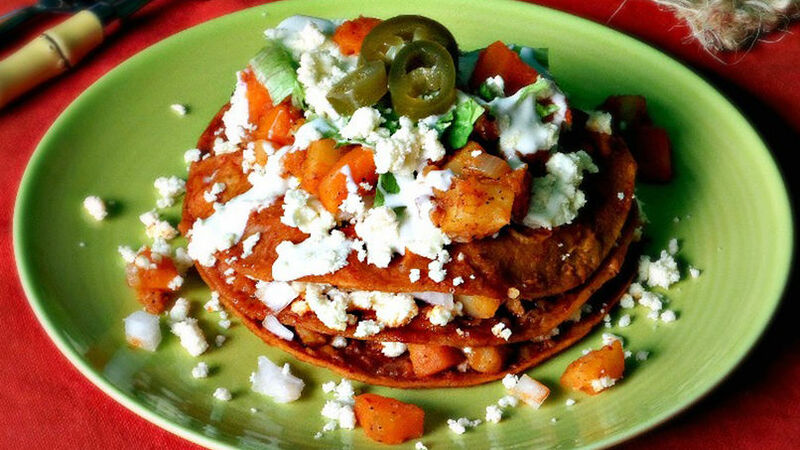 Traditionally, enchiladas mineras are stuffed only with cheese and onions, and they are topped with carrots and potatoes. However, the potato and carrot stew is so delicious that it should be included in every layer of the enchiladas. Make these enchiladas for your family and discover this gem of Mexican cuisine.